I know. I know. 2 blog posts in one week? back to back? whaaaaat? Crazy… but I had to. I can’t bottle it in any longer. 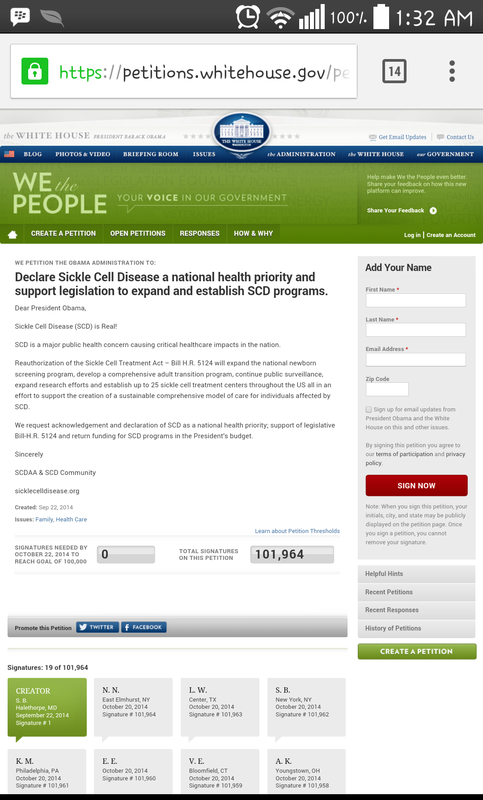 About 1:30 AM, I got tagged in an IG post regarding the White House petition going on for Sickle Cell Disease to be declared a national priority and have budget for programs. Well I needed to see this for myself as I have literally stalked the site since the petition started. Believe me when I say I left the web page opened and kept refreshing ever so often, I definitely had sincere worries that we might not get the 100K signatures we desperately needed and I did everything in my power to tell people about the petition. At many point of my social media “trolling”, I call it advocacy, instagram blocked me from making comments on anyone with lots of followers that weren’t following me… I think my multiple comments on either Kevin Hart or his fiance did it for me the first time, I lost track of the others who may have caused my blocked 😂😁 iDied. I’m pretty sure some youtubers probably hates my gut right about now, I was hijacking FB posts and videos y’all. I was so desperate. I thought about taking tablets and phones with me to the mall to get signatures, I even wished I was famous so I could use that platform to get the signatures. I was THAT desperate. 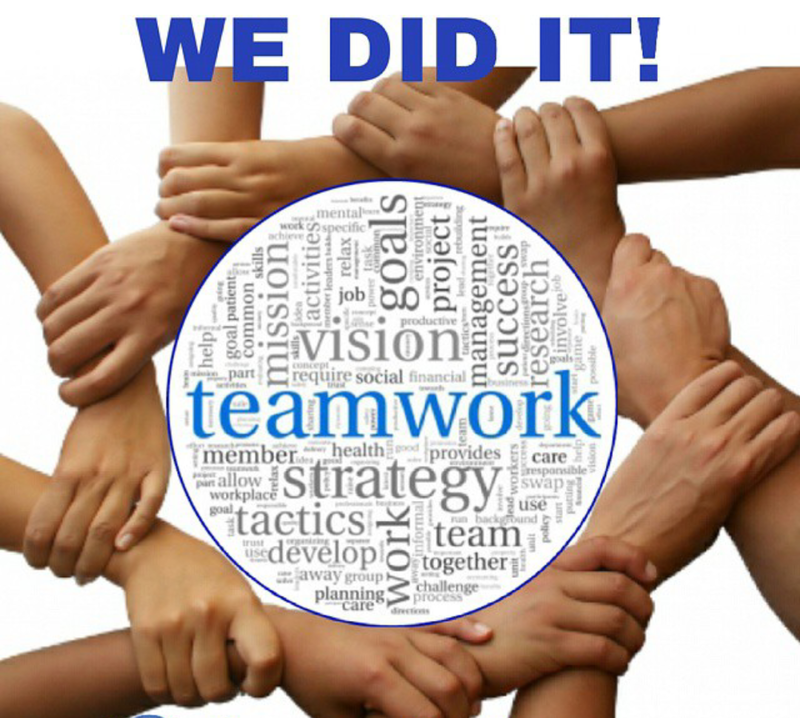 But y’all, we did it! I got to find out later that Khloe Kardashian posted about the petition on her instagram page, honestly I have a new love for her, she has always been my favorite Kardashian but THIS made her even more awesome in my eyes. We also had other celebrities who supported the cause; Kevin Hart, Nick Cannon, Nelly, Dondre Whitfield, Jackie Long, they encouraged people to sign the petition. My only problem with that was that some of them didn’t even post the plea on their personal accounts for even more people to see, but that didn’t entirely stop people from signing, they definitely helped with those videos. We say thank YOU to them too. Since I’m giving thanks, I’d like to say a huge heartfelt THANK YOU from all warriors and their supporters, who tirelessly fight for us. Words cannot express our gratitude for you guys taking time out of your day to support such important cause. Thank you for backing us, for bringing this issue to the surface, it’s been a long time coming. The Black Panthers will be proud of the work we have all done, but it is just the beginning… I urge you all to continue to support us and join in the awareness wagon in every way possible. Also a huge thanks to Tboz of TLC! She’s carried the flag for us for so long and continues to represent the invisible, forgotten disease. She’s such an inspiration to every single warrior out there, thank you Tionne 💛💛. Nigeria, I and my team are coming for you, you’re next. yep yep!!!! When I saw the update, I thought of you! Your campaigning made me sign! My cousin is also a warrior in this battle… I call her my barbie! Despite (and even during) her worst battles, she smiles… while I ball like a baby! LOL But God is good. Change is happening!